Smoking enhances salmon's natural flavor while adding deep smoky notes. Although the process itself is relatively simple, especially if you have an electric smoker, it does require preparation. The fish needs to cure to replace some of the water in the fish with a mixture of sugar and salt, which adds flavor and extends the fish's shelf life. Store smoked salmon in the refrigerator for up to 14 days, or freeze it for later use. Fill a container with water and add the wood chips. Soak them for a minimum of 2 hours or as long as overnight. 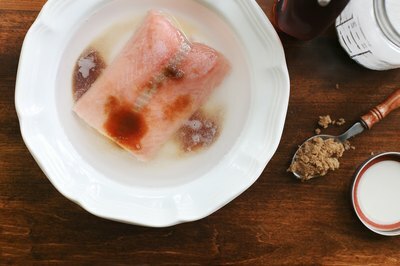 Cure the salmon by soaking it for 8 to 36 hours in a brining solution made with 1 part kosher salt, 1 1/2 parts maple syrup, 3 parts brown sugar and 12 parts water. Alternatively, dry-cure the salmon by coating each fillet with a mixture made with equal amounts of granulated and brown sugar, along with 75 percent as much kosher salt and some crushed black pepper. Optionally, add seasonings such as cloves or bay leaves according to your personal preference. Refrigerate the salmon while it cures. 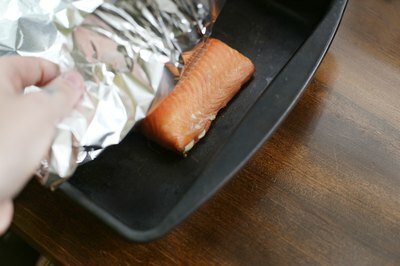 If you’re dry-curing it, place the salmon on a baking sheet that’s been lined with foil and plastic wrap. 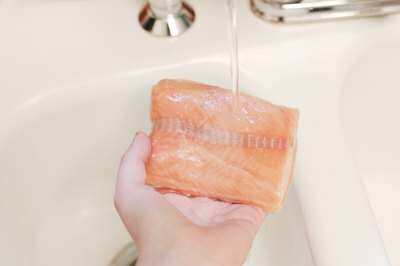 Cover the dry-curing salmon with a second sheet of plastic wrap. Top it with foil and tightly wrap the fish before topping it with a weighted baking sheet. Dry-cured salmon should be ready in 8 to 10 hours. 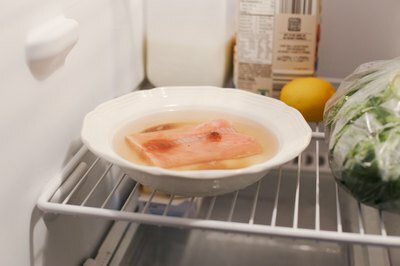 Remove the salmon from the refrigerator, drain the brine or unwrap the dry-cured salmon and rinse the fish thoroughly. 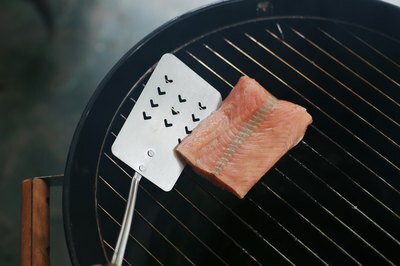 Pat the cured salmon dry with a paper towel and arrange the salmon fillets on a wire cooling rack to dry. Allowing the fish to thoroughly dry for up to 3 hours helps it develop a pellicle, which is a dry and shiny layer on the fish that grabs and holds onto the smoke. Add water to the pan of an electric smoker. 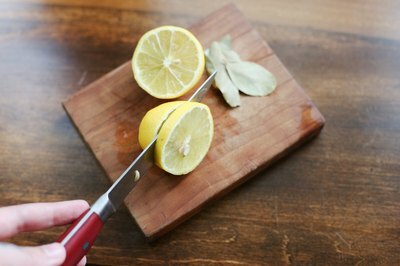 Optionally, include additional flavoring ingredients in the water such as wine, peppercorns, bay leaves or cut lemons. 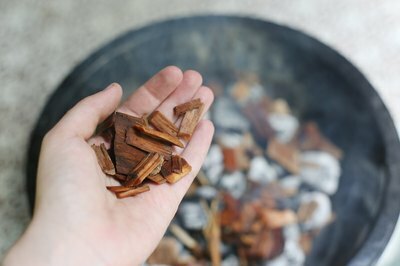 Drain a few of the soaked wood chips and arrange them near the coils of an electric smoker, or the charcoal if youre using a charcoal smoker. 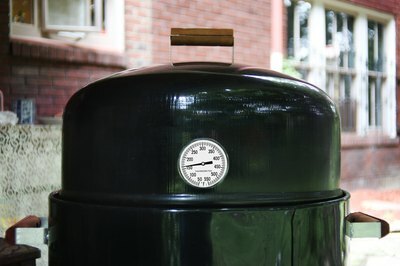 Set the heat of the smoker to a temperature of 150 to 160 degrees Fahrenheit. Place the salmon in a single layer in the smoker and let it smoke for 1 to 3 hours, or until an instant-read thermometer inserted in the thickest fillet reads 140 F.
Remove the salmon from the smoker and place it on a baking sheet. Loosely cover it with foil and let it rest for 20 to 30 minutes before serving.